To make a short summation of a long walk, Mandela: Long Walk To Freedom is precisely the kind of film that would throw a title drop into its closing narration, because it does just that. It was always going to pale in comparison with the tributes and outpourings of affection that have followed the late South African president's death in December, but this is so distinctly average that it looks like a mere monument. That you most of us already know about Mandela's life and accomplishments is no bar to the film walking through the motions of that story, apparently oblivious to the fact that this straight line is probably not the most interesting route. Moving quickly on from an opening image from his childhood, William Nicholson's script takes on the length and breadth of the leader's experience, from his decision to join the ANC, through his more radical period, his subsequent arrest and arduous imprisonment, to his ultimate election as South Africa's first elected black leader. I hope we can all agree that this film's probably spoiler-proof. It's tough to avoid being cynical about a biopic that comes out this close to Oscar season, which means it's a bit difficult to separate it from the way in which it offers little more in the way of insight than if you spent the same amount of time watching biog packages on BBC News 24, around the beginning of last month. But the film does feel like something of a letdown. 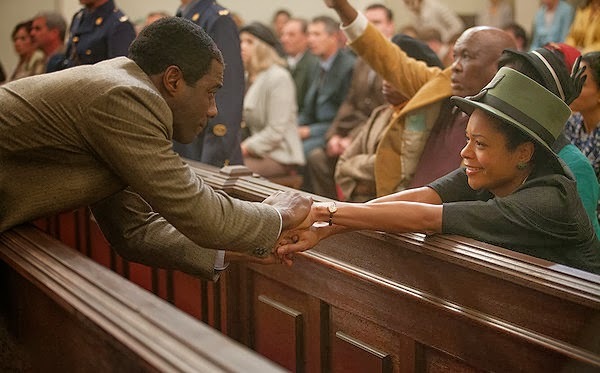 In discussing its failings, I have to put aside Idris Elba and Naomie Harris, in the roles of Nelson Mandela and Winnie Madikizela, because they're both more or less excellent. Harris more than holds her own in a film that clearly belongs to her co-star, but Elba is the real revelation. On paper, I felt like he was a little miscast, but on the strength of his performance, it feels almost like everyone was relying on him to pull the film up by its bootstraps, and he comes pretty close to accomplishing that at times. He's suave with Winnie, in the brief scrapes that Nicholson and director Justin Chadwick have with Mandela's youthful womanising, and builds a picture of a really magnetic personality, somewhat separate from the media picture of a wise and elderly Mandela, with which we have grown so familiar. It's not long before they have him in old-man make up, and while he does a terrific job of portraying the character's maturation, I struggle to think of when the "age them up with make-up" gambit has ever worked in a serious biopic, outside of Raging Bull. The film has so much work for itself, it surpasses two hours as a matter of course, but despite the running time, it can only feel rushed. Even with the combined might of Elba and Harris in the centre, it feels almost like a whistle-stop tour. I've had more than enough of cloying biopics, but in a film that encompasses racial inequality, the deaths of Mandela's friends through police brutality, an arduous prison sentence that lasts most of our protagonist's life and his ultimate willingness to forgive, you shouldn't have to cloy in order to move me. This is like the opposite extreme to those overly sentimental biopics. 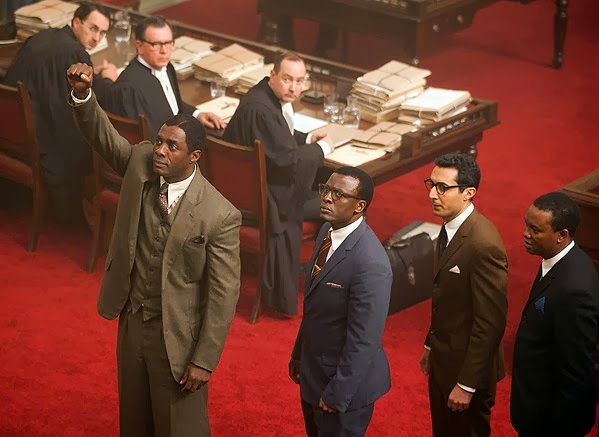 Despite a phenomenally charismatic performance from Idris Elba, Mandela: Long Walk To Freedom is a dramatisation that will feel more at home in the classroom than in the cinema. I would love to admire it for exploring Mandela, rather than embalming his character in a sentimental historical epic, but this has different problems. It has a sprawling scope, but that leaves it feeling perfunctory as it moves from one milestone to the next, and occasionally even contact-less. 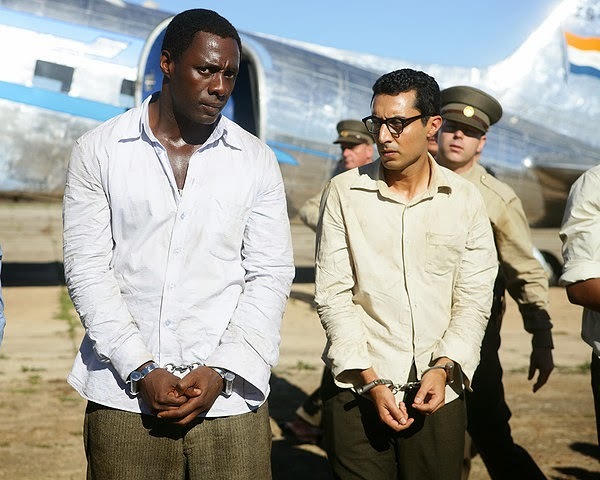 Mandela: Long Walk To Freedom is now showing in cinemas nationwide.